Clarence "Kelly" Johnson was a pioneer in aeronautical engineering and aircraft design and was the visionary behind planes like the X-104 Starfighter and the Blackbird family, which includes the SR-71. He was the first team leader at the famous Lockheed Skunk Works and personally scouted and picked the location for and initiated construction of the airbase at Groom Lake, NV, better known as Area 51. He also witnessed UFOs with otherworldly capabilities on two occasions and wrote in his official report on his 1953 sighting, "For at least five years I have definitely believed in the possibility that flying saucers exist — this in spite of a good deal of kidding from my technical associates. Having seen this particular object on December 16th, I am now more firmly convinced than ever that such devices exist, and I have some highly technical converts in this belief as of that date." Johnson was a rare two-time winner, in 1958 and 1963, of the Collier Trophy, an annual award given to the greatest achievement in aeronautics or astronautics in America in the previous year and placed 8th in Aviation Week's "Top 100 Stars of Aerospace" poll of members of the International Council of the Aeronautical Sciences (ICAS) and its U.S. affiliate, American Institute of Aeronautics and Astronautics (AIAA) behind the likes of only the Wright Brothers, Leonardo da Vinci and Charles Lindbergh. He was also awarded the Presidential Medal Of Freedom by Lyndon Johnson in 1964. His credentials as a UFO witness are unimpeachable. But long before all that, on December 16, 1953, Johnson was in his home three miles west of Agoura, CA and looking out the window. In his official report, available in its' entirety here, he describes seeing a solid object hovering over what he estimated to be Point Mugu, which was and is also the location of a Naval Air Station, not quite 20 miles west of his home. "When it did not move or disintegrate, I asked my wife to get me our 8X binoculars, so I would not have to take my eyes off the object, which by now I recognized as a so called 'saucer.'" The time was about 5 PM and the setting sun was below the horizon line, leaving the ellipsoid UFO silhouetted. By the time Johnson got the binoculars and went outside for a better view, the object was moving away from him and out over the Pacific Ocean. "I gathered its' speed was very high because of the rate of foreshadowing of its' major axis. The object, even in the glasses, appeared black and distinct, but I could make out no detail, as I was looking toward the setting sun, which was, of course, below the horizon line," he wrote. The UFO continued on its' path westward in a slight climb and disappeared in 90 seconds according to Johnson. He did not make an estimate of its' dimensions. I cobbled together this accurately scaled 3D visualization of what Johnson saw through the binoculars and I added an airplane model for reference. It's pretty easy to tell it's supposed to be a plane. The plane is about 10 miles from the camera and scaled to a wingspan of 100 ft. The UFO is 20 miles away and scaled to 200 feet (more on the reason for that later). You see they both look the same size. I took the additional step of scaling each object 8X larger to match Johnson's binocular aided viewing. Weather conditions are a huge factor, and they sound perfect for being able to keep the UFO in view for a great many miles. I estimate, and I think this is very conservative, that with the aid of binoculars, Johnson would have been able to keep the UFO in sight up to 70 miles away. Clear day, backlit by a setting sun. No reflection off the vehicle that might have caused it to blend into a background sky or clouds perhaps obscuring detail that would have made a conventional aircraft obvious. In fact, the conditions were just the opposite. The more you look at it, the more you just have to say it's a helluva case. But there's more: Johnson was not the only witness, there were four others and they were in flight several miles to the south! While testing out a Lockheed WV-2 Constellation over the Catalina Channel, four crew members, flight engineer R.L. Thoren, test pilot Roy Wimmer, aerodynamics engineer Philip Colman and flight test supervisor J.F. Hare, saw the same UFO Johnson did. They describe the exact same hovering for a couple minutes and then flying on a path westward and leaving their sight within a matter of seconds. Still, there are differences between the accounts of the crew members, their official reports available here, and Johnson's and what the crew attempts to do very quickly is try to gauge the size of the object based on quantities they already know. Hare initially thought it might be a Globemaster C-124, which had a wingspan of 174 feet. Colman thought the UFO might be a Convair B-36, which had a wingspan of 230 feet. Those were big planes, especially for the day. The exact size of the UFO obviously can't be known but I think a reasonable estimate is 200 feet. If it were much smaller, say less than 150 feet, I frankly don't think the airborne witnesses could have seen it at all. They all must have had eyes like hawks as it was, being more than twice as far away as Johnson and not having the aid of binoculars. And if the UFO were bigger than 200 feet? Now we get to the speed of the UFO, something neither the crew nor Johnson attempt to estimate and with good reason! I also accept Point Mugu as the general location where the UFO was hovering. The only fixed point we're sure of is Johnson's location . . . . home. I don't know exactly where he lived but he did. The two other points, the UFO and the crew of witnesses, obviously float along the timeline of five or so minutes total. During the hovering phase with aid of binoculars, Johnson is able to get a good look and the object is about 20 miles away. For an object that size to completely vanish, I estimate it has to travel at least 50 miles further away in the 90 seconds. I think that is conservative when you figure that the airborne witnesses see the object from not quite 50 miles away at first and with unaided vision. With the binoculars, Johnson should be able to see the UFO well beyond 70 miles away. But 50 miles in 90 seconds is 2000 mph. 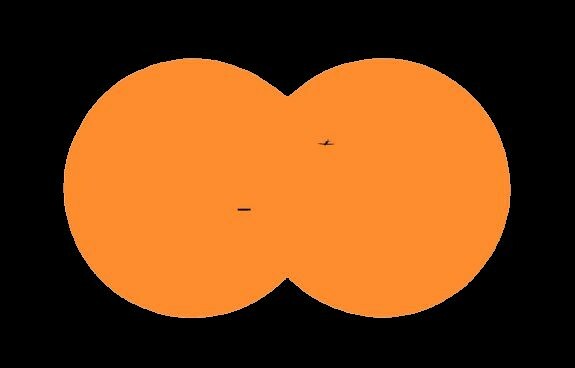 Whether the UFO was smaller and much closer to the witnesses than they thought or it was bigger and further away, the UFO had to be traveling at beyond 2000 MPH to follow a path, get smaller and finally leave the witnesses' sight. They all state this. The bigger it was, the faster it must have been traveling. One curious discrepancy between the accounts is that the airborne witnesses were able to make out a crescent/flying wing shape from more than double the distance of Johnson and without the aid of binoculars, and Johnson was not. For Johnson to only see a saucer shape, I think the UFO would have had to remain at just the right angle to him the entire sighting. The official explanation was that they all saw a lenticular cloud, but the path westward the vehicle took and the speed it left the area in seem to rule that out. Whatever Johnson and the flight crew really saw that day, filing an official report didn't seem to negatively effect his career. Johnson was already chief engineer at Lockheed's Burbank plant, would be selected to break ground on the mysterious Area 51 air base in 1955 and became Lockheed's vice president of Research Development Projects in 1958. 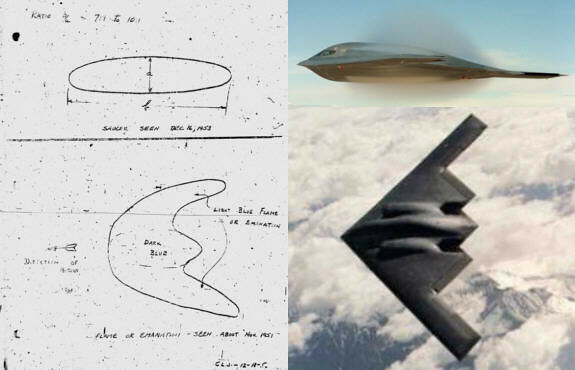 Well if you think the entire case is interesting, take a look at Johnson's drawings from his two sightings and compare them with the Northrop B-2. It's almost like a Johnson fan at Northrop read his UFO report, looked at the drawings and a light bulb appeared over his head. It's certainly a much more elegant design than Lockheed's boxy F-117. The bottom drawing was from the earlier incident in November 1951 and it is clearly described as an emanation from an object Johnson couldn't make out, not the object itself, but the gestalts are amazingly similar. Clarence "Kelly" Johnson had his following, no question about that, and his influence reverberates through the aeronautics industry to this day. The question is what influence did alien spacecraft have on Johnson? Northrop had a flying wing, the YB-49, in the air in the time frame. It fits as far as size and shape but wasn't that fast.